Adam Cobb will present organ works by Bach, Brahms, Vierne and others at the May 20, 4 p.m. concert at Messiah Lutheran Church. Adam Cobb recently graduated with his master’s in organ performance at Florida State University, where he studies with Dr. Iain Quinn, and will start on his doctorate in the fall. Originally from Madison, Alabama, he received his bachelor’s in music composition from Samford University. Mr. Cobb currently serves as the Choir Director/Organist at Episcopal Church of the Advent in Tallahassee, Florida. Mr. Cobb is becoming increasingly active as a concert organist with forthcoming concerts including appearances at the Cathedral of St. Philip, Atlanta, and the Mayfair Organ Series at St. George, Hanover Square, London, United Kingdom. As a composer, Adam Cobb has had several pieces premiered in academic and church settings. Most recently, his settings of the Preces and Responses, Magnificat, and Nunc Dimittis were premiered at Episcopal Church of the Advent during a service of Choral Evensong and his composition Voices (for SATB divisi chorus, cello, piano, and fixed media) was premiered at Samford University. His song cycle Journey of Hope (for soprano and piano) was commissioned by his voice teacher at the time and Florida State University alumna Dr. Christina Villaverde. 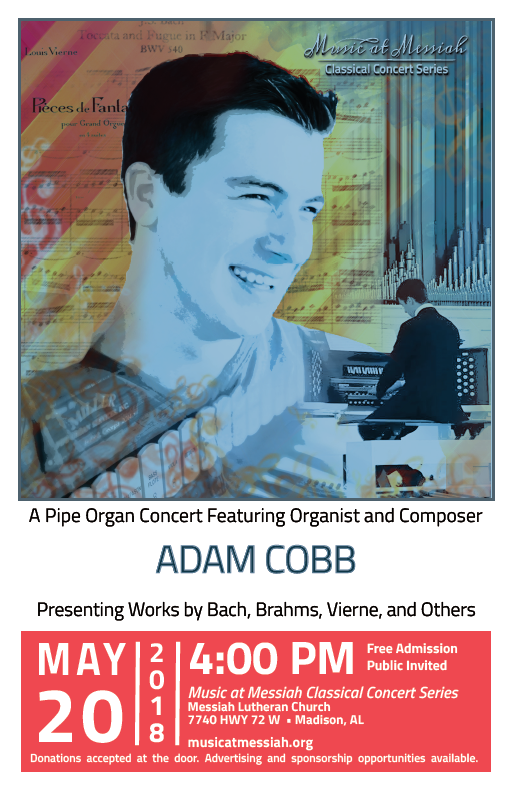 The concert brings Cobb to his hometown of Madison, Alabama and the cities only pipe organ. The organ was installed in 2014 a few years after the church’s sanctuary expansion project. The custom built, refurbished organ was designed by Miller Organ Company of Buford, GA, and features over 800 pipes specifically tailored to fill Messiah’s acoustically splendid sanctuary with rich textures and tonal variety.